This is a new Yankee type screwdriver adapter so you can use your 3/8" drive socket set with this adapter, and your Yankee spiral ratchet screwdriver to form a nice nut driver combination! 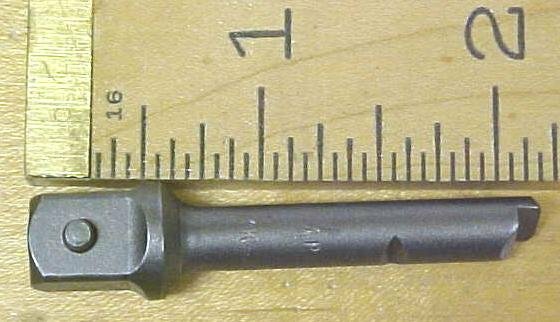 The adapter will fit many different screwdrivers, made by Stanley, North Brothers, Greenlee, and some made in Germany models. These are some of the North Brothers or Stanley numbers this adapter will fit: No. 30, 30A 130A, and several others that have the medium diameter shank size .280 (9/32") diameter. It will fit some other brands and some other models, like the Millers Falls 61A, and Greenlee Yankee style chuck screwdrivers in this size as well. The 1/4" square drive end has the normal spring loaded pin to help hold your sockets in place. The adapter works great on the sockets we tested including vintage Craftsman sockets! We should also mention the Yankee screwdrivers make excellent nut drivers as well! A very useful tool! If you are interested in the other two sizes, please note we also have other sizes listed on this website as well. We do have hex head adapters for sale, for the this size and other size Yankee style screwdrivers on this website. Items Similar To "Yankee Screwdriver Adapter to 3/8 In. Socket for No. 30, 30A, 130..."